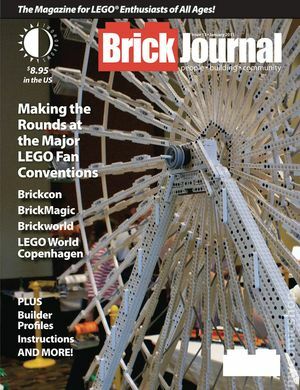 BrickJournal is a special event issue! It features event reports from BrickMagic (the newest US LEGO fan festival, organized by BrickJournal magazine), Brickworld (one of the oldest US LEGO fan events), and others! Plus: spotlight on BIONICLE Builder Norbert Lagubuen, our regular column on minifigure customization, step-by-step 'You Can Build It' instructions, spotlights on builders and their work, and more! Cover price $8.95.